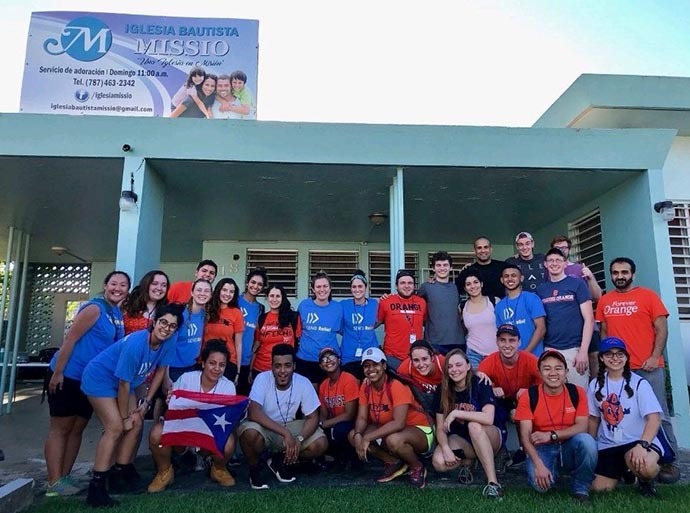 Christian Outreach and the Baptist Chaplaincy at Hendricks Chapel are organizing two opportunities during upcoming academic breaks to assist the residents of Puerto Rico as they continue to recover from the effects of Hurricane Maria. Two service trips will be made—one during Spring Break (March 9-15, 2019) and another just after the spring 2019 semester concludes (May 18-24, 2019). Students will be selected for the trips through an application process. Syracuse University and SUNY College of Environmental Science and Forestry undergraduate and graduate students are invited to apply. Application deadlines are Dec. 9 for the Spring Break trip and Feb. 24, 2019, for the May 2019 trip. The cost of each trip will be $800-$1,000 per student volunteer to cover airfare, food, transportation and lodging. More information and the online application can be found at https://orgsync.com/10919/forms/341454. Questions can also be directed to Bartholomew at 716.983.7786 or dtbartho@syr.edu.